During hot summer months, snakes can be a real problem especially in areas with long grass. Keep your family safe and keep the snakes away using this humane yet effective solar powered snake repellent. 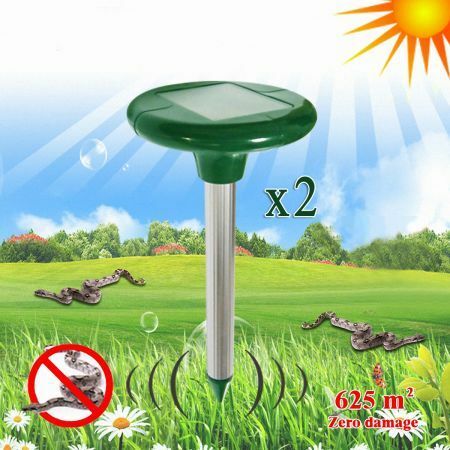 Easy to use and install, simply place this solar powered snake repeller into the ground. It will transmit ultrasonic waves via vibration through the ground every 30 seconds. How does this ward off snakes? For the same reason you may have been told to stamp the ground every so often when walking through snake-prone areas. Snakes dislike confrontation, and have sensors all along their body to detect disturbance around them. If they detect something like this snake repellent, they will move away from it as it scares / annoys them! Notice: External DC charger is not included.